The sound of Queen and Freddy Mercury is a staple of the music industry, and the piano tone you hear on those records is unique and recognizable. 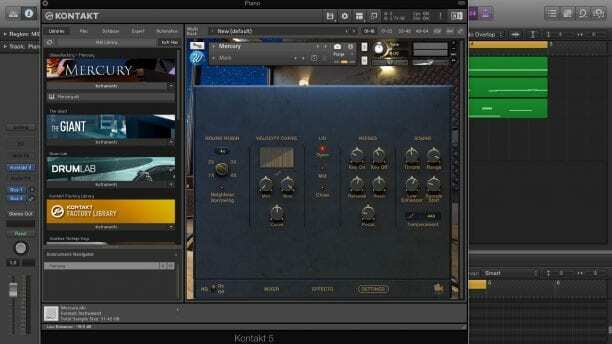 When Wavesfactory went to Metropolis Studios in London to capture that famous sound, great care was taken to make sure every nuance of the Fazioli F228 so it could be faithfully reproduced in the form of the Wavesfactory Mercury plugin, which was recently released as a Kontakt Player instrument. Freedy Mercury’s legacy, however, is important to protect. Does the plugin do so? We took if for a spin to find out. Mercury is an impressive virtual instrument and makes you feel like you’re sitting right in Metropolis Studios. It even looks like you’re there with it’s beautifully polished user interface. The interface itself is divided up into four main tabs — a main interface, a mixer tab, an effects tab, and a settings tab. Each of those is laid out super simply — which is a good thing. Sure, sometimes it can get annoying bouncing back and forth between the tabs, but the trade-off is a clean interface and we think it’s worth it. The main tab really just showcases a graphic of the piano in question, and it looks very classy. When you jump over to the mixer tab, you’ll be greeted with different levels for different microphones — more on that later. The effects tab gives you the ability to tweak the verb on the piano, while the settings tab offers options like having the lid open or closed and other things like that. What you’ll first notice is how simple the plugin is to use and get the best sound from without having to tinker. Not only that, but the dynamic range you can get from playing at different velocities is fantastic compared to other piano sample libraries we’ve tried. Mercury was sampled with eight velocity levels, which we think is enough to produce a realistic performance sound. Even then, turning on HQ mode from the main window allows for samples to blend and eliminate jumps between those velocity levels. Of course, there is a cost — heavy CPU use. We found not using HQ is great for rehearsing and jotting down ideas, you may want to switch HQ on for bouncing out tracks, just to ensure you get the best sound possible. When you jump into the mixer tab, your tone options really open up. In fact, you’ll get a hefty 5 different microphones to mix between. Mercury was recorded with five microphones at different distances: ultra close, close, mono, mid and far. On top of that, you have the ability to mute, solo, pan and adjust the width of these microphones, giving you loads of tonal options. We’re fond of the Position Enhanced mixing option; this gives you an easy way to blend between microphones in an easy close to far transition. 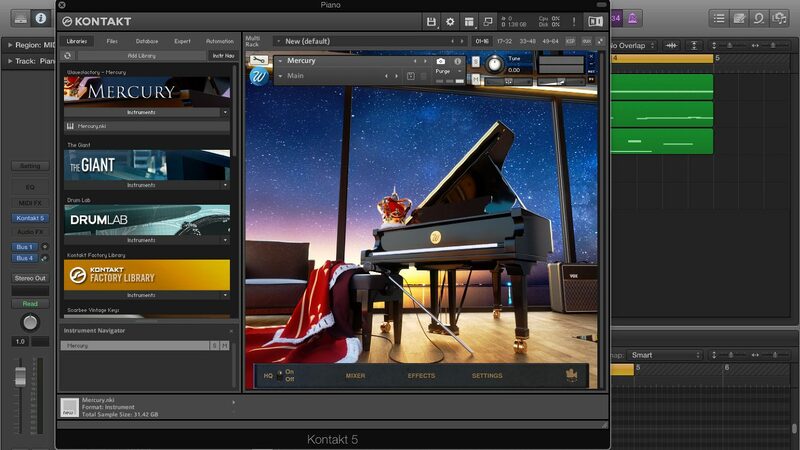 The effects tab has many options to fit the piano into the musical style you’re working on. The main focus is the Metropolis Plates, which are two EMT140 plate reverbs sampled from the studio, and they sound beautiful — they’re authentic, and allow the piano to sit nicely into a mix. This reverb along with the compressor opens up options to fit many genres too. Don’t forget to make some tweaks in the settings tab. The detail put into the sounds made by the piano shines here, with the ability to change the piano lid position, overall timbre of the sound and even mix the noises made by pressing down the sustain pedal and the key on and off sounds. You can also change the round robin settings to allow notes to ring out more naturally and dynamically. The main drawback to the Wavesfactory Mercury is that you’ll need to be aware of how taxing it can be on your computer. To bring such a legendary sound into your library obviously takes a lot of memory — and that’s to be expected. The full library adds up to a hefty 34GB, and RAM usage is around 300MB per microphone. If you’re considering using Mercury in a live application, make sure it can handle the processing without dropping samples. Using only the microphones you need can help with this. We’re smitten with the Wavesfactory Mercury, especially since it blows away many of our other go-to piano plugins, such as Native Instruments’ The Grandeur and The Maverick. With so much control available in such a simple interface, there’s no doubt it will make a great addition to your library. You can get the Wavesfactory Mercury for yourself at the links below.